"IB#21: Lodgepole Pine-Specific Machines" is available in PDF format. To view it, please click here. collects cones faster than the clipping method. is safer than leaning out of a helicopter. 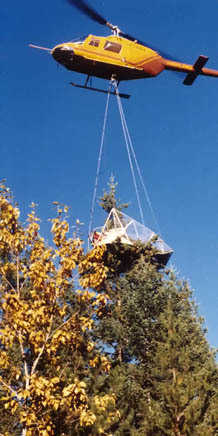 requires no helicopter lift to cut branches. 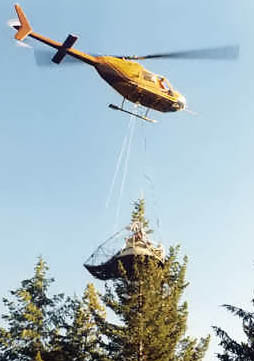 You've probably read that in true fir, the Fandrich aerial rake collected cones 4 times faster than the aerial clipping method using an operator leaning out of a helicopter. a self-contained hydraulic system on the fibreglass body shears the tops which fall into a basket. THEN phone Helmut Fandrich for more information about the new patented Fandrich Aerial Shear which has been in operation for three years. And to top it all off, for 1988 the rental rates Fandrich Aerial Shear are the same as for the Fandrich Aerial Cone Rake: a $300 service charge plus $25 per hectolitre of cones collected. *Factors affecting rate: crop density, flight distance, quantity of tops collected and quantity of cones rejected. "IB#7: Operating Instructions — Fandrich Aerial Shears" is available in PDF format. To view it, please click here.